Born prematurely with cerebral palsy, Tevin Cherry has been fighting his entire life. Fortunately, he refuses to be defined by his condition thus continues to push himself each day. In the video below, you’ll see him work through a set of handstand pushups. Tevin began lifting weights in high school to improve his performance on the wrestling team. When he began lifting, he struggled to lift just the bar. 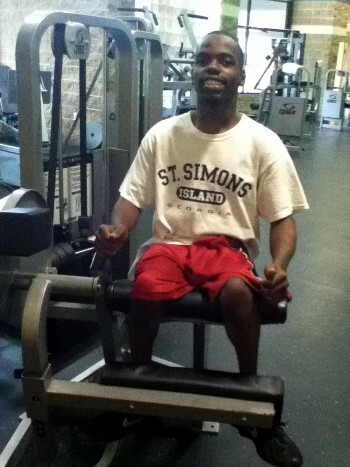 Through hard work and dedication however, Tevin began lifting much more impressive loads. In the time since, he has graduated from college, has expanded his exercise repertoire, and plans to continue training in Brazilian jiu-jitsu. He’s certainly a go-getter with an endless list of ambitious goals to pursue. It’s safe to say that we could all benefit from Tevin’s drive. We may not be forced to battle the obstacles that stand in his way, but we can certainly put forth the same effort to improve. Tevin is AMAZING! I’ve never seen anyone do that in my gym. Wow, wow, wow! Absolutely fantastic-keep up the good work Tevin!